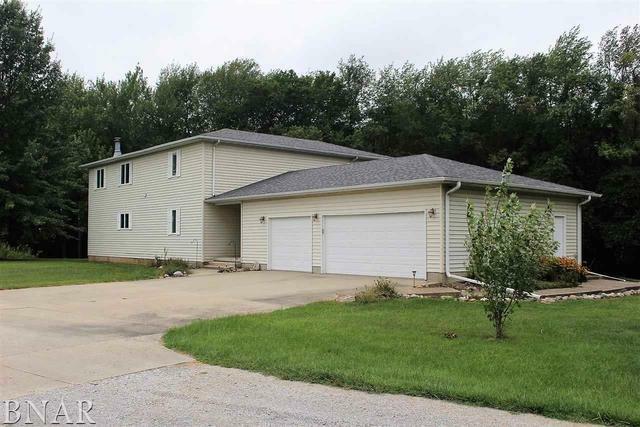 Great country property located near Clinton Lake and centrally located between Bloomington, Champaign and Decatur. This was a custom built home with master suites available on the 1st or 2nd floors both with walk-in closets. The upstairs bathroom has been updated with quartz counter top and tiled walk-in shower. You will also find a family room/office with a wood burning fireplace and bookshelves on the second floor. Spacious kitchen with open views to the 2nd floor and backyard. Beautiful wide plank Cerra Bella engineered wood floors throughout many of the rooms. Enjoy the large screened-in porch overlooking the tree lined views of the backyard. A Morton pole shed with two separate areas. 36x42 with 10&apos; rafters and a 8&apos; door. 36x45 with 14&apos; rafters and (2) 12&apos; doors. Perfect for boats and travel trailers. Roughly 5 1/2 acres of cropland that is currently planted in Soybeans. The perfect place to have your own mini farm!